The combine harvester, or simply combine, is a machine that combines the tasks of harvesting, threshing, and cleaning grain crops. The objective is the harvest of the crop; corn (maize), soybeans, flax (linseed), oats, wheat, or rye, among others. The waste straw left behind on the field is the remaining dried stems and leaves of the crop with limited nutrients which is either chopped and spread on the field or baled for feed and bedding for livestock. The combine was patented in 1834, by Hiram Moore, the same year as Cyrus McCormick was granted a patent on the mechanical reaper. Old Style Harverster found in the Henty, Australia region. Early combines, some of them quite large, were drawn by horse or mule teams and used a bull wheel to provide power. Tractor-drawn, PTO-powered combines were used for a time. These combines used a shaker to separate the grain from the chaff and straw-walkers (grates with small teeth on an eccentric shaft) to eject the straw while retaining the grain. Tractor drawn combines evolved to have separate gas or diesel engines to power the grain separation. Today's combines are self-propelled and use diesel engines for power. A significant advance in the design of combines was the rotary design. Straw and grain were separated by use of a powerful fan. "Axial-Flow" rotary combines were introduced by International Harvester "IH" in 1977. About this time, on-board electronics were introduced to measure threshing efficiency. This new instrumentation allowed operators to get better grain yields by optimizing ground speed and other operating parameters. A John Deere 9410 Combine set to harvest Oats. Combines are equipped with removable heads (called headers) that are designed for particular crops. The standard header, sometimes called a grain platform (or platform header), is equipped with a reciprocating knife cutter bar, and features a revolving reel with metal or plastic teeth to cause the cut crop to fall into the head. A cross auger then pulls the crop into the throat. The grain header is used for many crops, including grain, legumes, and many other crops. Wheat headers are similar except that the reel is not equipped with teeth. Some wheat headers, called "draper" headers, use a fabric or rubber apron instead of a cross auger. Draper headers allow faster feeding than cross augers, leading to higher throughputs. In high yielding European crops, such headers have no advantage, as the limiting factor becomes grain separation. On many farms, platform headers are used to cut wheat, instead of separate wheat headers, so as to reduce overall costs. Dummy heads, or pick-up headers, feature spring-tined pickups, usually attached to a heavy rubber belt. They are used for crops that have already been cut and placed in windrows or swaths. This is particularly useful in northern climates, such as western Canada, where swathing kills weeds, resulting in a faster dry down. Occasionally, row-crop heads are seen that function like a grain platform, but have points between rows like a corn head. These are used to reduce the amount of weed seed picked up when harvesting small grains. Self propelled Gleaner combines could be fitted with special tracks instead of tires to assist in harvesting rice. Some combines, particularly pull type, have tires with a diamond tread, which prevents sinking in mud. The cut crop is carried up the feeder throat by a "chain and flight elevator," then fed into the threshing mechanism of the combine, consisting of a rotating threshing drum, to which grooved steel bars are bolted. These bars thresh or separate the grains and chaff from the straw through the action of the drum against the concave, a shaped "half drum," also fitted with steel bars and a meshed grill, through which grain, chaff and smaller debris may fall, whereas the straw, being too long, is carried through onto the straw walkers. The drum speed is variably adjustable, whilst the distance between the drum and concave is finely adjustable fore, aft and together, to achieve optimum separation and output. Manually engaged disawning plates are usually fitted to the concave. These provide extra friction to remove the awns from barley crops. An interesting technology is in use in the Palouse region of the Pacific Northwest of the United States, in which the combine is retrofitted with a hydraulic sidehill leveling system. This allows the combine to harvest the incredibly steep but fertile soil in the region. Hillsides can be as steep as a 50 percent slope. Gleaner, IH and Case IH, John Deere, and others all have made combines with this sidehill leveling system, and local machine shops have fabricated them as an after-market add-on. The first leveling technology was developed by Holt Co., a California firm, in 1891. Modern leveling came into being with the invention and patent of a level sensitive mercury switch system invented by Raymond Hanson in 1946. Raymond's son, Raymond, Jr., produced leveling systems exclusively for John Deere combines until 1995, as R. A. Hanson Company, Inc. In 1995, his son, Richard, purchased the company from his father and renamed it RAHCO International, Inc. In April, 2007, the company was renamed The Factory Company International, Inc. Production continues to this day. Sidehill leveling has several advantages. Primary among them is an increased threshing efficiency on sidehills. Without leveling, grain and chaff slide to one side of separator and come through the machine in a large ball rather than being separated, dumping large amounts of grain on the ground. By keeping the machinery level, the straw-walker is able to operate more efficiently, making for more efficient threshing. IH produced the 453 combine, which leveled both side-to-side and front-to-back, enabling efficient threshing whether on a sidehill or climbing a hill head on. Currently, sidehill leveling is on the decline with the advent of huge modern machines which are more stable due to their width. These modern combines use the rotary grain separator which makes leveling less critical. Most combines on the Palouse have dual drive wheels on each side to stabilize them. Self-propelled combines started with standard manual transmissions that provided one speed based on input rpm. Deficiencies were noted, and in the early 1950s, combines were equipped with what John Deere called the "Variable Speed Drive." This was simply a variable width shive controlled by spring and hydraulic pressures. This shive was attached to the input shaft of the transmission. A standard 4 speed manual transmission was still used in this drive system. The operator would select a gear, typically third. An extra control was provided to the operator to allow him to speed up and slow down the machine within the limits provided by the variable speed drive system. By decreasing the width of the shive on the input shaft of the transmission, the belt would ride higher in the groove. This slowed the rotating speed on the input shaft of the transmission, thus slowing the ground speed for that gear. A clutch was still provided to allow the operator to stop the machine and change transmission gears. Later, as hydraulic technology improved, hydrostatic transmissions were introduced by Versatile Mfg for use on swathers but later this technology was applied to combines as well. This drive retained the 4 speed manual transmission as before, but this time used a system of hydraulic pumps and motors to drive the input shaft of the transmission. This system is called a Hydrostatic drive system. The engine turns the hydraulic pump capable of high flow rates at up to 4000 psi. This pressure is then directed to the hydraulic motor that is connected to the input shaft of the transmission. The operator is provided with a lever in the cab that allows for the control of the hydraulic motors ability to use the energy provided by the pump. By adjusting the swash plate in the motor, the stroke of its pistons are changed. If the swash plate is set to neutral, the pistons do not move in their bores and no rotation is allowed, thus the machine does not move. By moving the lever, the swash plate moves its attached pistons forward, thus allowing them to move within the bore and causing the motor to turn. This provides an infinitely variable speed control from 0 ground speed to what ever the maximum speed is allowed by the gear selection of the transmission. The standard clutch was removed from this drive system, as it was no longer needed. Most, if not all, modern combines are equipped with hydrostatic drives. These are larger versions of the same system used in consumer and commercial lawn mowers that most are familiar with today. In fact, it was the downsizing of the combine drive system that placed these drive systems into mowers and other machines. First of all the header, described above, cuts the crop and feeds it into the threshing cylinder. This consists of a series of horizontal rasp bars fixed across the path of the crop and in the shape of a quarter cylinder, guiding the crop upwards through a 90 degree turn. Moving rasp bars or rub bars pull the crop through concaved grates that separate the grain and chaff from the straw. The grain heads fall through the fixed concaves onto the sieves. The straw exits the top of the concave onto the straw walkers. Since the IH 1440 and 1460 Axial-Flow Combines came out in 1977, combines have rotors in place of conventional cylinders. A rotor is a long, longitudinally mounted rotating cylinder with plates similar to rub bars. Heavy material, such as unthreshed heads, fall off the front of the sieves and are returned to the concave for re-threshing. Case IH Combine set to harvest soybeans. 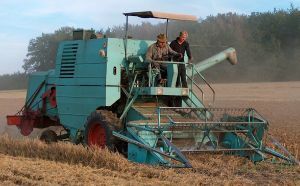 The disadvantages of the rotary combine (which were increased power requirements and pulverization of the straw by-product) prompted a resurgence of conventional combines in the late nineties. Perhaps overlooked, but nonetheless true, when the large engines utilized to power the rotary machines were employed in conventional machines, the two types of machines delivered similar production capacities. Also, research was beginning to show that incorporating above-ground crop residue (straw) into the soil is less useful for rebuilding soil fertility than previously believed. This meant that working pulverized straw into the soil became more of a hindrance than a benefit. An increase in feedlot beef production also created a higher demand for straw as fodder. Conventional combines, which use straw walkers, preserve the quality of straw and allow it to be baled and removed from the field. ↑ AGPowermag.com, The First Combined Harvesters. Retrieved October 14, 2007. ↑ The Factory Company, Homepage. Retrieved October 14, 2007. History of Sunshine Harvesters - Museum Victoria, Australia. Pictures of Gleaner leveling combines. This page was last modified on 13 March 2017, at 22:34.